Offices with their own Freight Elevator access are common and are spread throughout Manhattan today. Only a select few commercial buildings in the city feature a loading dock though. It can be assumed because of these issues finding and leasing the right office with freight access can be a challenging prospect for those not in the know - after factoring in all other caveats from; location to price to square footage and more! A freight elevator, also known as a service elevator, is constructed to transport materials, furniture, and goods. A freight elevator is not used for passenger transport. 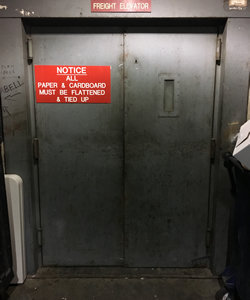 Written notice is required in freight elevator to alert passengers of prohibited use. Some freight elevators allow passenger use by need to meet passenger elevator requirements. To allow a freight elevator to carry passengers, a solid inner door is sometimes required. Due to the purpose of transporting heavier goods, a freight elevator is larger than passenger elevator. Many freight elevators have manually operated doors. 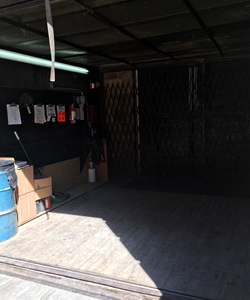 The interior finishes of the cab are unpolished to avoid damage when loading and unloading goods. Traction freight elevators are more energy efficient for lifting heavy goods than hydraulic freight elevators. Hydraulic elevators are ideal for buildings with less than eight floors. This type of freight elevator is ideal when the weight of a single item is not more than ¼ capacity of the elevator for load distribution. Transportation of goods are handled manually and by hand trucks. The sole purpose of Class B freight elevators is to transport automobiles (trucks or passengers). Class C1 freight elevators uses a forklift or other motorized vehicles to load and unload goods. The goods must not exceed the rated load including the vehicle. In the Class C2, the platform can hold 150% of the rated load even during the loading and unloading of goods. The loader may use a forklift to load or unload goods unto the platform up to the rated load. Unlike the Class C2, Class C3 the rated load is not to be exceeded by any amount even during the loading and unloading of goods. As you search for office space with a freight elevator to best suit your needs, we can assist in analyzing and finding the best options for your business. It should be noted that back in 2009 - the City Council approved a bill requiring commercial building owners and managers to provide access for bicycles. Contact us for more information and available spaces at no obligation or fee!